This is a full-featured blog running on MODX Revolution 2.1.3. Commenting is taken care of by Disqus, but all other "blog-engine" functions are done via the following free MODX extras: • Blogging Essentials package • getResources • getPage • If • getChildCount (by Jason Coward) The Gallery addon with PrettyGallery package (Ben Marte) was installed to handle blog-post galleries and images. It also features mobile-manager for posting-on-the-go via the Handyman addon (Mark Hamstra). Flexible, HTML5 & CSS3 layout, bit of jQuery, social media & SEO friendly - this theme will be packaged for distribution through the MODX repository after extensive testing. 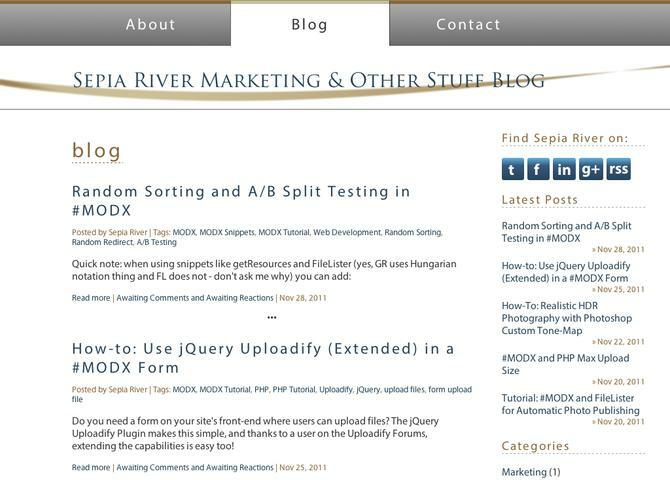 Visit Sepia River Marketing Blog.